Dr. Gipson was honored at the annual Faculty Recognition Dinner on March 29, where her fellow faculty members erupted in applause at the announcement. 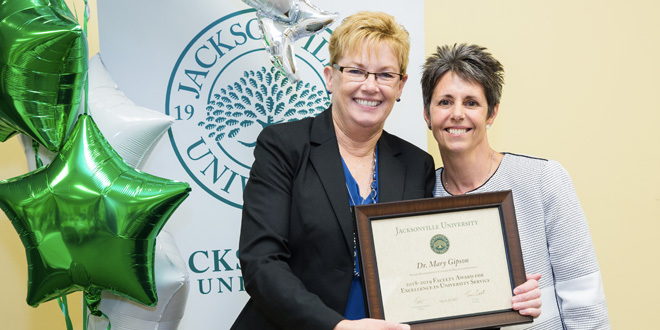 In her 19 years of teaching at undergraduate, graduate and doctorate levels at JU, Dr. Gipson has also served on the Faculty Executive Committee for several years, and served as Faculty Chair for the past two years. WAVE Online sat down with Dr. Gipson after the big announcement to hear her unique perspectives on being an educator and a voice for the faculty. 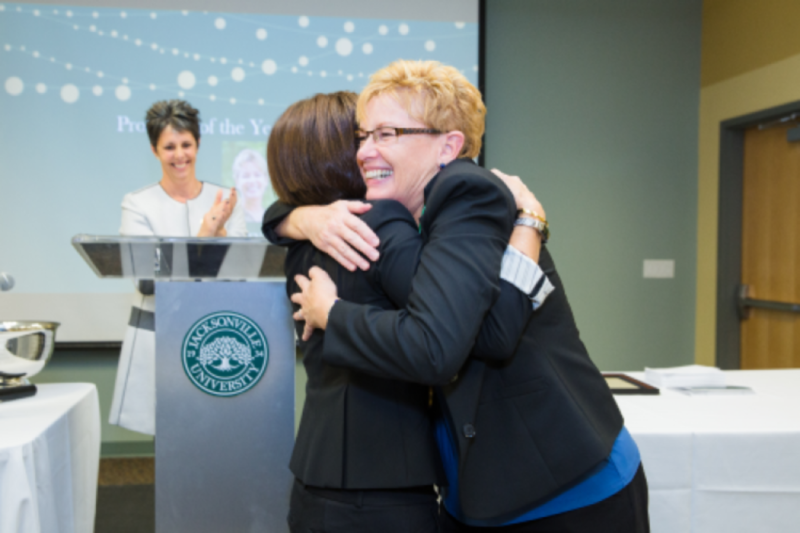 Dr. Mary Gipson, Professor of Nursing, hugs Dr. Sherri Jackson after being named the 2019-20 Jacksonville University Professor of the Year. Photo by Laura Evans. WAVE: What do you love most about educating the next generation of nurses? WAVE: What’s the biggest challenge today’s nursing students face when they enter the job market and how do you prepare them to overcome that? WAVE: You have served as the Chair of Faculty for the past two years. Tell us more about your role in that position. WAVE: What do you love most about your role as Chair of the Faculty?